The importance of materials testing cannot be underestimated. Across every major industry, manufacturers, developers and operators of critically important systems, products and components need to be assured that the materials employed in forming their equipment are up to their intended tasks. That’s why the most diligent method of verifying that the materials companies use in manufacturing processes will perform to expectations and adhere to all applicable regulations is through reliable materials testing. Of course, for most manufacturers, their business involves a good deal of innovation through research and development. Moreover, there’s significant financial and competitive pressure to be the first to market when a new product and/or material is discovered as a result of R&D breakthroughs. But this scenario also poses great risks, since a company that goes to market too quickly with a subpar material or faulty component can face anything from costly recalls and litigation proceedings to an erosion in consumer confidence that leads to a loss of customer loyalty. For any manufacturer, recent images of overheated laptops, smartphones and hoverboards bursting into flames should be warning enough that thorough materials testing isn’t a luxury. Instead, it’s a necessary step on the way to ensuring successful manufacturing outcomes. In addition, many business sectors — from aerospace and defense to consumer goods and construction — must adhere to strict quality control and safety standards. If they don’t, they face the possibility of having steep fines and penalties levied against them by the regulatory associations that oversee their industry. This requirement is understandable when you consider the responsibilities placed upon companies supplying the products that form crucial components in bridges, aircraft, nuclear reactors, automobiles, medical devices or military equipment. Again, in all of these instances, the purpose of materials testing is to provide the manufacturer with as much information as possible about the composition, strength and overall quality of the materials they intend to employ in the construction of their products. Organizations, businesses and consumers place their confidence in materials every day. Whether we’re shopping in hardware stores or pharmacies, we’re constantly caught up in the cycle of choosing products, reading their labels and researching their usage based on their product descriptions. Materials testing forms the backbone of this relationship between product reliability and the materials that go into making products. That’s why manufacturers rely on the results of materials testing to tell them everything from the composition of an alloy intended for use in medical implants to the flammability of a new material for the construction industry. Materials testing can and should be completed on everything from thermoplastics to adhesives, composites to glass, thermosets to titanium and more. 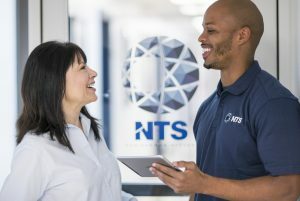 As one of the nation’s largest and most trusted commercial test laboratories, NTS maintains a network of professional materials testing labs around the country. We can perform incisive analyses of rubber strength and resistance, as well as abrasion resistance, surface, fracture and plating analysis of a wide array of the most in-demand materials used in all types of manufacturing processes. Corrosion phenomena testing is also routinely performed using a variety of corrosive agents and test materials. Fatigue studies are another major component of materials testing, particularly when working with ASTM, nuclear or custom specs. NTS fatigue studies are conducted for rubber, plastics and other materials. For more information about our capabilities, contact an NTS lab near you. Composition: Oftentimes, businesses need to know with certainty what materials are in the composite materials they intend to use — such as thermoplastics, resins and sandwich core materials. Shear: Materials testing designed to measure shear strength typically quantifies how much stress a specimen can take before rupturing and is often used to test the strength of adhesives. Thermal: For any product that will undergo temperature changes — think of a satellite’s solar panel — thermal testing forms a vital part of verifying the material’s ability to function in its eventual environment of use. Flexure: When a product like an I-beam or girder used in construction must support a predetermined amount of weight without sagging, a flexure materials test is often performed to verify that the specimen can withstand a certain level of stress without flexing. Ozone and gas exposure: When it comes to determining the lifespan of materials, especially elastomer materials intended for outdoor use, exposure to concentrated levels of ozone is a popular materials test to check the degradation of the specimen. Tensile/Compression: From plastics and metals to adhesives and rubbers, tensile/compression testing is a form of materials testing that places specimens under precise compressive loads to measure their ability to withstand compression before deformation occurs. Corrosion: To verify that a given material will be able to reach a certain length of service before failure occurs, a corrosion test is often performed, especially for industries manufacturing infrastructure components expected to withstand certain environmental conditions for extended periods of time without degrading. Fatigue: Used to determine both the upper limit of one load a material can withstand before failing as well as the number of repeated loading cycles it can survive, fatigue testing looks at a material’s limit to withstand stresses before it suffers a permanent change to its structure. Impact: Especially for determining the ability of certain metals to absorb the resulting energy from a measured impact, this form of materials testing is used widely to test the toughness of a sample under challenging and often highly destructive conditions. Flammability: For many products, including consumer goods, textiles, furniture, bedding and parts used in both the transportation and aerospace industries, there’s no substitute for a flammability test to ensure the quality of the product and the safety of consumers. Thermomechanical analysis: By applying a consistent force to materials such as polymers, glass, laminates and ceramics while they undergo varying temperature changes, thermomechanical analysis — or TMA — can determine the linear expansion and/or phase changes a specimen undergoes as a result of this materials test method. Clearly, materials testing can take many forms. Its comprehensive ability to verify the performance of specimens submitted for testing can be broken down into five umbrella categories: mechanical testing, tests related to electrical properties, resistance testing, tests related to thermal properties and nondestructive testing. With vast experience in providing manufacturers with all types of these materials tests, the talented professionals that make up the NTS team are keenly aware of the primary applications of these highly informative tests. Requirements of regulatory standards: When a product’s weakness or poor performance could result in serious damage to the lives of consumers, military personnel or other professionals, regulatory organizations — like the American Society for Testing and Materials, the International Organization for Standardization, the U.S. Department of Defense and others — typically attempt to prevent such failures by issuing standards that manufacturers are expected to adhere to. Materials testing conducted by a lab like NTS that’s well-versed in standards such as MIL-STD-810 for military contractors and FAA regulations for aerospace manufacturers is a prudent choice to ensure compliance. Selection of materials: At the end of the day, manufacturers are only as good as their suppliers’ raw materials. For this reason, at any stage associated with selecting materials — whether for a new product or a new supply chain — the testing of materials to assess their integrity is vital for a reliable product that will eventually leave your production line and go into general use. Design of a product: For many manufacturers, producing a best-in-class product means added profitability by winning over customers to the product and the brand. 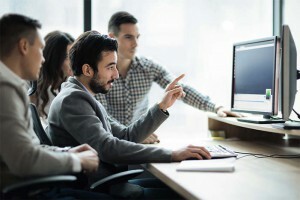 That’s why, during the design phase of a product, materials testing can efficiently inform the manufacturer of weaknesses in the product while changes can still be made to the materials used and the product’s overall construction so that the finished product is more robust and deserving of a best-in-class title. Verification of production: For both first runs of newly introduced products — as well as ongoing checks of products already in production — the verification that no faults or weaknesses are being added to products as a result of the production processes they undergo is an invaluable application of materials testing for manufacturers. Aerospace: Aerospace materials must be thoroughly tested against all the various environmental stressors they encounter in a typical flight. NTS has the experience and the lab facilities necessary to ensure conformity with RTCA DO-160 as well as FAA and other regulations. For testing oversized components or complete assemblies, we can engineer custom chambers and fixtures that meet the specific requirements of your project. When it’s essential to have full knowledge of the materials you’re using in order to deliver reliable and robust products to your aerospace clients, you can count on us to provide you with the tests you need. Defense: NTS has a long history of providing materials testing services for defense contractors. Our Camden, AR facility is fully capable of performing arena testing of warheads and weapons, fully instrumented small, medium, and large caliber ranges, and much more. All facilities are equipped with state-of-the-art data acquisition tools that generate precise and meaningful results, making it easy to demonstrate compliance with MIL-STD-810 and other regulations. We have the know-how and facilities to help you fulfill your business’s mission while the quality and reliability of your products enable the members of the military to fulfill theirs. Telecommunications: The NTS network contains more commercial telecom test laboratories than any other company in North America. We can assist at all stages of the development process by providing materials testing services that eliminate uncertainty and help you deliver superior products for both residential and commercial use. The more connected our world gets, the more we rely on our telecom infrastructure to deliver uninterrupted service. Let our expertise improve your products and reduce your liability. When the pressure is on to get to market quickly with a product that consumers can trust, there’s no substitute for the timely materials testing services we provide for the telecom industry. Consumer goods: Corrosion and stress resistance are important selling points for a number of consumer goods. Materials testing is about more than just maintaining compliance — it’s about delivering a product that’s tough enough to withstand anything the average user can throw at it. NTS helps by identifying potential problems early, allowing your team to make the necessary changes without further delays. We know from experience that well-timed materials testing can help manufacturers enhance their products, win more customers and ultimately build stronger brand loyalty. NTS materials testing labs are ISO/IEC 17025-certified by the American Association for Laboratory Accreditation. As the noted benchmark among labs for technical competency, this certification means that our equipment is well-calibrated, our personnel are highly trained and our facilities are specifically set up to provide you with reliable and consistent testing services. We exist to help you make better, safer, more reliable and compliant products. That’s why you’ll find that working with us is always a respectful, professional experience where your needs are fully listened to and focused solutions are thoughtfully provided in a timely manner. We can quickly turn around projects of any size, even those with complex environmental or materials testing requirements. Contact us today to learn more about NTS materials testing services or request a free quote for your upcoming project.